Our recent exhibit at the Civic Centre in Blanchardstown made it into a number of newspapers and online media sites including the July – August edition of Dublin Gazette (page 2) and online on Dublinlive and so we thought we’d share it here. A LEGO exhibition will be on display at Blanchardstown Library this Saturday, July 28. The exhibit will see some of Ireland’s best adult LEGO builders display dozens of creations to the public. The creations – which range from an abandoned bridge to a model-size version of Dublin’s Custom House – will be on view during library opening hours. Admission to the exhibition is free and it is open to the general public. All are welcome. Check out some of Dublin’s most iconic buildings as you’ve never seen them before. The urge to start building something when we see LEGO never really leaves us – but some people take it to a whole other level. 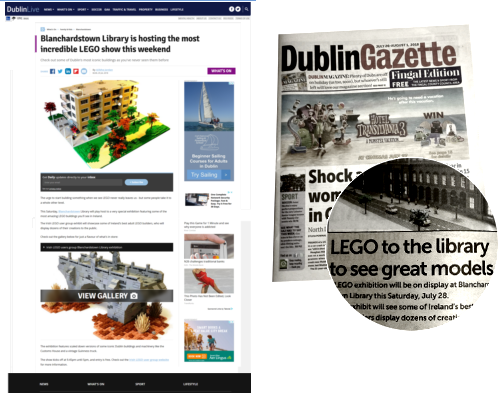 This Saturday, Blanchardstown Library will play host to a very special exhibition featuring some of the most amazing LEGO buildings you’ll see in Ireland. The Irish LEGO User Group exhibit will showcase some of Ireland’s best adult LEGO builders, who will display dozens of ​their creations to the public. Check out the gallery below for just a flavour of what’s in store. The exhibition features scaled down versions of some iconic Dublin buildings and machinery like the Customs House and a vintage Guinness truck. The show kicks off at 9.45pm until 5pm, and entry is free. Check out the Irish LEGO User Group website for more information.